If your loved one has died and you're the beneficiary of a retirement account such as an IRA or 401(k), then you can take over control of the account simply by presenting the deceased owner's original death certificate to the bank or other company where the account is being held. But before you do, you'll need to understand the tax consequences of inheriting the account. The results will be very different if you're a surviving spouse as opposed to another type of beneficiary. In some instances, the surviving spouse will simply elect to roll over the IRA or 401(k) into his or her retirement account. If this is the case, then all of the deferred income taxes associated with IRA or 401(k) will continue to be deferred until the surviving spouse makes withdrawals from the account. Aside from this, the surviving spouse will be able to use his or her life expectancy for taking required minimum distributions and will also be able to choose who will receive the account after the surviving spouse dies. The benefits of this type of election ideally work in the limited situation where the first spouse dies well before the age of 70 1/2 and the surviving spouse is under the age of 59 1/2 and several years younger than the deceased spouse. In this circumstance, the surviving spouse will be able to defer taking required minimum distributions until the deceased spouse would have been required to take them and still be able to withdraw funds from the account without incurring the 10% early withdrawal penalty. Then, once the surviving spouse reaches age 59 1/2, he or she can roll over the account into his or her retirement account. While the account is still considered to be the deceased spouse's account, the surviving spouse should be able to choose who will receive the account if the surviving spouse dies before reaching 59 1/2. If the IRA or 401(k) becomes a part of the deceased spouse's A or B Trust due to the beneficiary designation and/or a disclaimer by the surviving spouse, then the income taxes will still be deferred until the surviving spouse makes a withdrawal from the account. But once the account becomes part of the A or B Trust, the surviving spouse will be required to start taking minimum distributions calculated over his or her life expectancy. Also, the surviving spouse won't be able to change the beneficiaries of the account after the surviving spouse dies. 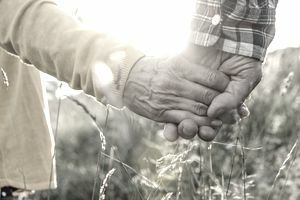 While 100% of the fair market value of the IRA or 401(k) will be included in the value of the deceased spouse's estate for estate tax purposes, since spouses can leave assets at death to each other free from estate taxes due to to the unlimited marital deduction, the deceased spouse's estate won't owe any estate taxes on the IRA or 401(k). Instead, when the surviving spouse later dies, 100% of the fair market value of the IRA or 401(k) on the date of the surviving spouse's death will be included in the surviving spouse's estate if the surviving spouse elected to roll over the IRA or 401(k) into their account or used it to fund the A Trust. On the other hand, if the IRA or 401(k) was used to fund the B Trust, then the IRA or 401(k) won't be included in the surviving spouse's estate. Transfer the Account into an Inherited IRA: If you elect to transfer the account into an inherited IRA, then you'll be required to begin taking minimum distributions by December 31 of the year following the deceased owner's death and the distributions will be calculated over your life expectancy. You can also take out additional amounts as needed. Each time a distribution is taken, be it required or not, the amount of the distribution will be included in your taxable income. But be aware that currently for some 401(k)s, transferring the account into an inherited IRA is not an option due to the policies of the company maintaining the plan. However, the Worker, Retiree and Employer Recovery Act of 2008 (or WRERA) requires all employers to offer this option by January 1, 2010. Cash out the Account in Full: If you choose this option, then 100% of your distribution will be included in your taxable income. The entire fair market value of the IRA or 401(k) will be included in the value of the deceased owner's estate for estate tax purposes. Thus, if all of the deceased owner's other assets combined with the value of the IRA or 401(k) exceed the current federal or state estate tax exemption, then the deceased owner's estate will owe estate taxes. What Happens If the IRA or 401(k) Is Needed to Pay Estate Taxes? If the deceased owner's estate is taxable, but there aren't enough assets outside of the IRA or 401(k) to pay the estate tax bill, then this will pose a serious problem for the beneficiary of the IRA or 401(k). Why? Because each withdrawal from an IRA or 401(k) will result in the amount withdrawn being included in the beneficiary's taxable income. And what if the beneficiary needs to take additional cash out of the account to pay their increased income tax bill? It will result in additional income taxes on the amount withdrawn. The final result can be financially devastating to your loved ones - from 50% to nearly 90% of the retirement account being lost to the estate and income taxes. The only way to avoid this is to ensure that your estate has enough cash or other liquid assets outside of the retirement account to pay the estate tax bill.